Today was just one of those days that if I could have stayed nestled in the bed hidden from the world, I would have. But as life would have it that’s just not the case. I generally use the weekends to do laundry, hang with the kids and run errands etc. Saturday we took our first ever set of family portraits. Yes, 9 years of my husband and I being together and we’ve never once done the professional family photo thing. Save your judgement. Though I was super excited to do this, my anxiety was through the roof! Add the mall+holiday season+ everyone in the world trying to get holiday photos = a couple of ibuprofen and a glass of wine. I was so spent after spending over 2 hours in the portrait studio, I was crying to come home. Pics came out great though, so I can’t wait to pick them up on Wednesday. Today I did a quick DIY Arts & Craft with my daughter and her cousin. My son was too consumed with new toy cars inherited from his deceased grandfather and the Playstation 2. He only gets an hour on the game per weekend day so I wasn’t too mad at his disinterest in mommy time. 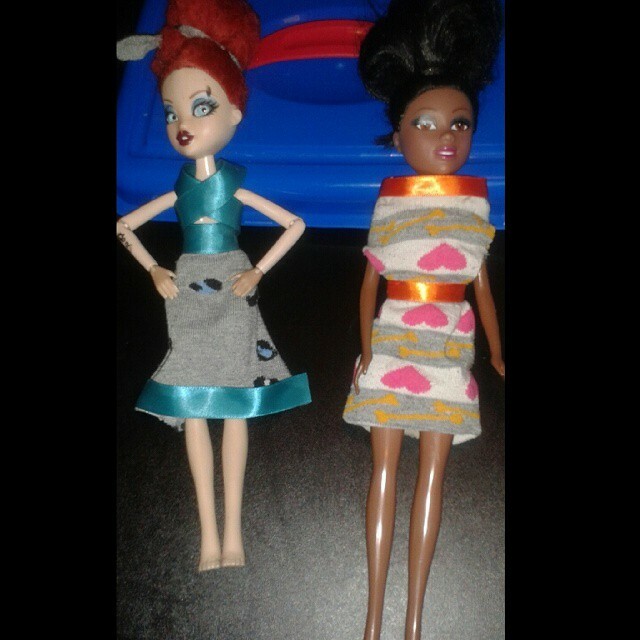 Nonetheless, we made doll clothes out of socks. Pretty funky if I do say so myself. I have other ideas for this bag of socks in my closet; but that will be a DIY Arts & Craft item for another day. That’s it for today folks; if you’d be so kind please follow me on Twitter @athomemomsays. Otherwise, enjoy your weekends and prepare for Monday! Sleep well!